A structured settlement is a financial arrangement that provides financial benefits to a plaintiff over the course of time, as opposed to a single lump sum all at once. Structured settlements are usually funded by defendants or their insures with the purchase of one or more annuities that offer a combination of period certain guaranteed payments, life contingent payments, and lump sum payments. With structured settlements, payments are spread out over time to meet the needs of the payees and their families. Instead of a one-time lump sum, with the risks inherent in sudden wealth, a structured settlement recipient receives payments spread across a long time frame. This may seem anticlimactic to people who are enamored with a large settlement up front. Yet such annuities often guarantee a better future through consistent payments than would a single one-time payment that can be easily spent in a matter of months. Strictly speaking, a structured settlement funded with an annuity provides consistent periodic payments. 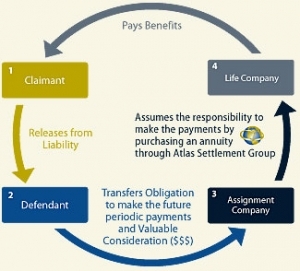 The injured party is the payee, and the annuity is purchased by the defendant and typically held by a qualified settlement fund of assignment company. Structured settlement annuities are usually issued by only the highest rated life insurance firms, and deliver guaranteed long-term income payments with significant and lasting tax advantages. First and foremost, payments are completely tax free to the recipients. This is memorialized in the Periodic Payment Settlement Act of 1982, more commonly referenced as section 26 U.S. Code § 130. The act not only officially recognized the existence of structured settlements at the time, it also promoted their utility in the cases of tort physical injury. The aggrieved party opens the process with a lawsuit against the defendant – the goal is to gain compensation for illness, an injury, or death of a loved one that was caused by the defendant. Commonly the guilty party will consent to provide the aggrieved party with a structured settlement rather than have the case actually go to trial. When the cases go through a long, expensive, and sometimes exhausting process and the judge rules for the aggrieved party, the court will make the defendant establish either a larger lump sum payment or a structured settlement. The defendant and plaintiff sit down with a structured settlement consultant – Structured settlement consultants greatly assist in the settlement process to determine the structured settlement terms. This includes the amount of the periodic payments, for how long they ought to last, and whether or not they need to go up in amount during later or particular times. A qualified assignee or intermediary is involved who takes on the defendant’s liability, and takes in the premium from the defendant that is necessary to fund to purchase the victim’s annuity. The qualified assignee then buys the annuity from a highly rated life insurance company – this is the point where the qualified assignee establishes the structured settlement annuity contract so that it will pay out according to the requirements of the agreed upon settlement. These annuity terms may never be altered once they have been set up. It is usual that part of the qualified assignment and settlement sets aside a one-time amount to pay to fund a trust or pay the expenses of the attorney. The life insurance company makes the annuity payments to the victim consistently and periodically as agreed – by the annuity contract terms. The structured settlement annuity typically includes monthly and lump sum payments, and interest accrues over time. Both the initial award and the interest earned on the annuity are tax free to the payee, and the added benefits and total payout to the annuitant can be substantial and last a lifetime. It’s important to note, however, that structured settlement annuities are inflexible. It is only possible for the victim to receive any additional cash out of the settlement before the scheduled payment if he or she sells rights to future payments. They can do this on the secondary market. Because life challenges, medical history, settlement costs, and a host of other considerations all need to be weighed when crafting a structured settlement, it is common for settlements to be complex and time consuming. The assistance of a skilled structured settlement consultant is essential to achieve the best outcome for all parties, and to find the right combination of benefits for appropriate compensation for the plaintiff’s injury. Will there by a lump sum paid out along with the periodic, dependable payments? How flexible will the structured settlement actually be? What will the beginning and end dates be on the annuity contract? What payment amount and payout frequency will be set? Who Uses Structured Settlement Annuities? 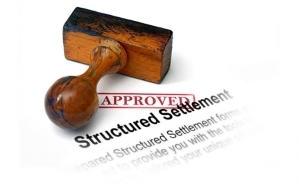 Structured settlements and structured settlement annuities are increasingly common. In fact, over $5.5 billion USD in new premium was written in structured settlement annuities last year alone. The most common scenario is for settling a lawsuit before a trial begins or out of the courtroom. With a majority of the claimants in these cases, weighing a structured settlement means deciding between a a one time lump-sum payment, or a more reliable annuity-backed income stream and lump sum payout. For defendants, structured settlements also are beneficial. In some cases it may lower the total cost of a settlement that they will have to pay as a result of their negligence or mistake. And defendants in many situations like the dependability and security of a guaranteed, reliable income. Interestingly enough, structured settlements did not originate in the United States even though we are a global center for their use. Instead they arose in Canada because of medical liability cases against thalidomide. The claimants obtained annuities which proved to be popular, and similar cases were filed around the U.S. It was the United States’ practice that made structured settlements so popular in the medical malpractice industry. The federal government saw the benefits that these structured settlements offered to accident victims and their families and wished to make such financial security a permanent and reasonable expectation. Thus, structured settlements (and the annuities behind them) became substantially more popular across America once the 26 U.S. Code § 130 federal legislation granted tax-free status the to payments for structured settlement payees. Structured settlements are designed to be permanent solutions to permanent losses. Wrongful death, medical malpractice, injury, and other claims that result in structured settlement awards leave permanent scars. As financial planners we would never encourage people to sell a structured settlement annuity payment stream without first exhausting all other avenues of credit and income. These might be options like a new job, a lower cost house, or other measures. The rationale here is simple- annuities are expensive, and if you already have a structured settlement annuity, you should only sell it if you are 100% sure you can make more with the money today than what you will get out of the annuity in the future. But if you are totally sure you need to sell, you owe it to yourself to get the best deal possible for your payments. Click Here to get a quote directly from an investor. It is typically factoring companies that buy structured settlement annuities. Factoring simply means advancing funds today for payments tomorrow. The factoring of structured settlements is a small industry in the larger financial landscape, but JG Wentworth is the largest company and has invested millions in becoming a household name. They have also gone bankrupt several times in the last few years. Initially, factoring was largely unregulated, but since 2002, the IRS section 5891 established a uniform process to transfer payments. This guidance prompted the states to adopt regulations governing the sale of payments, and we now have 49 states (all except New Hampshire) operating under consumer friendly protection statutes that provide safety and guidance for these transactions.